The customer is a leading Detection Systems solution provider. The customer is into Designing and Manufacturing of Thermal Radiation Detection System for Plants. Providing a Solution to Industry is one of the most critical requirements due to the High Severity level of the Domain. Due to high competition in the market, the customer satisfaction expectations are always high in terms of Delivery which in turn demands for shorter Design Cycles. A detailed three dimensional Finite Element Model was constructed for Thermal Qualification analysis of the Detector Assembly. 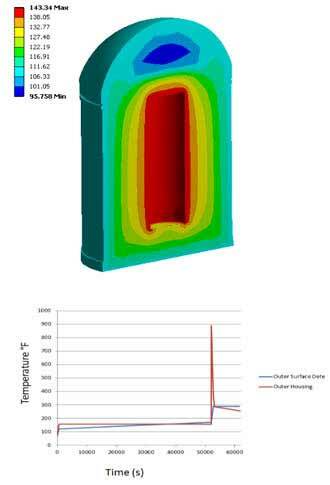 The software used to perform Thermal analysis was ANSYS v13.0 Mechanical Module. The model design and geometry was done using Solid Works Software. The analysis was performed to determine the maximum temperature of the detector by applying the Thermal Load Curve at the outer Housing which is having a very high peak for a very small duration. The objective was to find out the maximum temperature at the Detector when this peak temperature occurs at the outer Housing. The Filtration Area optimization simulation which was done with the help of ANSYS Design Modeler and Professional NLS, provided a technically feasible solution with increased output and also reduced the number of prototype as the first prototype gave a satisfactory performance.